The Iseki Unclemole TCC machine is the most versatile single-cutter-head microtunnelling machine available in the world for mixed soft ground conditions. With over 2000 units produced, it is also probably the most popular microtunnelling machine. At the heart of its success is the unique epicyclic rotation of its cutter head. 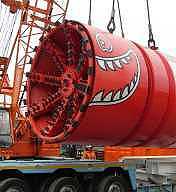 As well as rotating axially, so that the cutter arms can sweep excavated material into the cone, it also oscillates radially, giving a crushing action which copes with most ground materials. This avoids the need to use different heads for different ground conditions. The Unclemole is designed to be operated remotely, from an operation panel above ground. So an electronic fly-by-wire system collects signals from various transducers and sends them to the operation board, from where the operator can drive the machine.